Maintains bloom and doubles as a first feed to new home. Sunglo Pig Transition is a third stage starter designed to continue growth and development while maintaining bloom. Sunglo® Pig Transition is used in pigs weighing 40 pounds to 100 pounds. 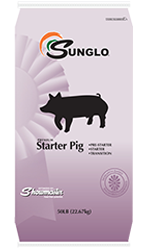 It is cost effective for use after Sunglo Starter to maintain bloom and maintain a high percent saleable pig. It’s also an effective receiver feed due to its palatability and combination of medications. Sunglo Pig Transition contains Denagard® for a broad spectrum control.